The largest parlour grand piano within the successful Tradition series, the W. Hoffmann T186 model embodies the coveted European acoustic quality. Its well-balanced, durably pleasant and richly coloured voice stems from the ‘C. Bechstein genes’ – a quality that’s rooted in the great German tradition of piano-making. C. Bechstein Europe’s Czech production site is unique on the continent. Its 150 skilled employees work in recently refurbished halls equipped with state-of-the-art technology and make every grand using production processes that combine craftsmanship and innovative methods. This investment of time for highly skilled piano makers to refine the instruments makes the difference compared to other makers’ mass production. For many generations in Hradec Kralove, piano-making skills have been handed down within families, where the art of piano production is so much more than a manufacturing process. Skill, dedication and precision all result in wonderful pianos from the Bohemian heartlands of Europe. The action of the W. Hoffmann T186 parlour grand piano boasts a wide dynamic range and is therefore suited to any musical interpretation. The entire instrument is made in the Czech Republic by C. Bechstein Europe specialists, who even voice the hammerheads manually. C. Bechstein Europe’s well-trained specialists know how to make a parlour grand piano with a pleasant sound, primarily because piano-making enjoys a long tradition in the region. 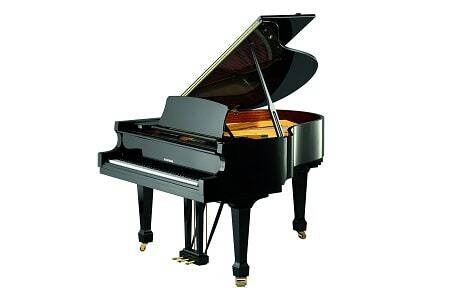 The Tradition T186 is a traditionally hand-crafted, European-made grand piano.